Green Peppers for my freezer. Do you purchase Green Peppers to use in recipes during the colder months? Do you live in an area where these Peppers are sold at roadside stands at this time of year? For me it's yes to both questions! That's the reason I purchase about 12 locally grown Green Peppers to prep and freeze. In the colder months when I'm cooking dinner it's easy to open our freezer door & take out a package of the Pepper strips. There's no reason for me to purchase a commercially frozen bag of Pepper chunks or purchase the fresh imported vegetable from my grocery store. Sunday was the day to move on my Pepper detail. 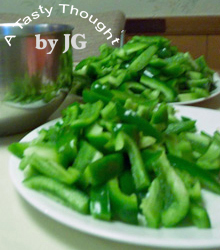 With not too much time involved my Green Pepper strips were in my freezer on Sunday afternoon. I'm posting my instructions again this year, because I see that you, my readers, have been searching for it. It's great to use the locally grown veggies during the colder months, too! Rinse Peppers under cool running water. Dry. Cut each Pepper in strips. Place a handful of Pepper strips in a plastic sandwich bag. (I do not use exact measurements.) I "eyeball" the amount I'd get from 1 whole Pepper for each bag. Close the sandwich bag and fold over. Carefully, place all sandwich bags in a Ziploc Freezer Bag. Seal, label and place in freezer. When you want a Green Pepper while preparing dinner, it's so easy to reach into the freezer. A year ago in May, I received the cutest little plant! 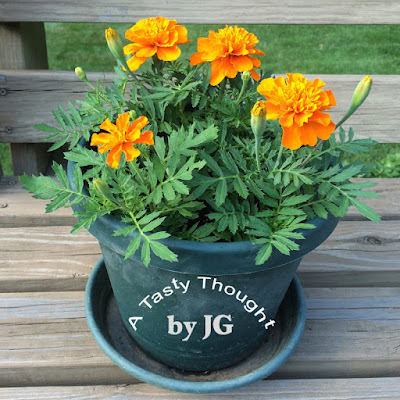 My 2 adorable little grandsons gave me a potted Marigold for Mother's Day. Into our front garden it went. Yes, it was given special treatment- watered every day with our sprinkler system, fertilized and boy did it flourish! Last Autumn I saved some of the seeds from my very special beautiful Marigold plant. This past Spring the seeds were planted in a pot. Somehow, a few seeds also found a home with the Zinnia seeds in our side garden. How did that ever happen??? Then, we had a lot of rain. Oops, not good for germinating seed! Well, one plant did grow in the pot & 3 other Marigolds were lookin' good with the Zinnia plants. A little transplanting to the pot was in order. Guess what??? Early this Summer- Marigolds growing from saved seeds! I've been enjoying my healthy Marigolds from the boys all summer. My pot has been filled with beautiful bright orange flowers & green buds that will open! Now, it's time to harvest some of the seeds, so a 3rd generation of Marigolds will grow & flower next summer. I am so onto this! 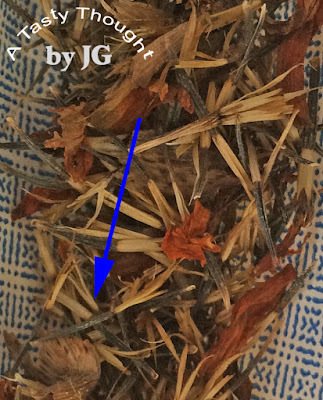 Now, I've saved a few of the dried blossoms to harvest my seeds for next year's plants! Inside the dried blossom pods are next year's crop! Harvesting the seeds is easy! Remove the dried pod from the plant outdoors. 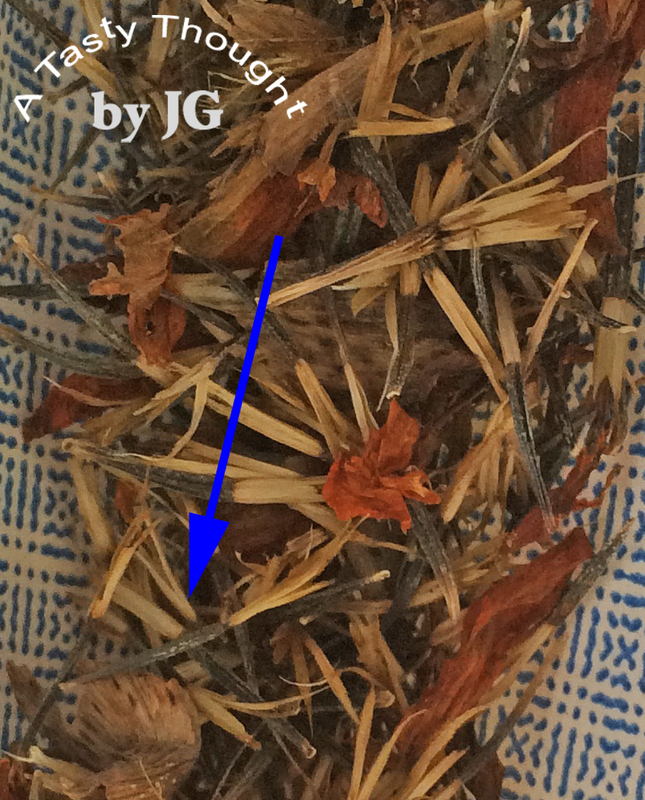 Then, separate the seeds inside the dried pod from the dried flower & pod. I store the seeds in an envelope to continue drying. See top photo. A few weeks later, label & seal the envelope. This is my treasure for next year's beautiful orange colored Marigolds in our yard! 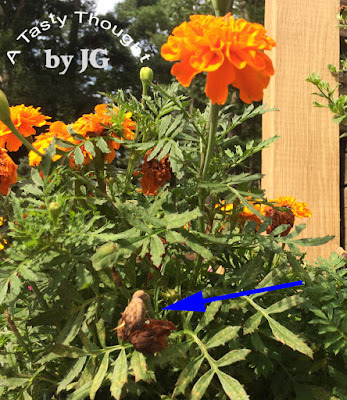 If you've been enjoying Marigolds all summer, save some of the seeds, too! Next spring after all danger of frost has left your area, plant the seeds outside. They can also be planted inside in containers in early Spring, if possible. I have plans for next year's gardens!!! It's so cool to grow plants from seed, especially when you've harvested the seeds from the previous year's flowers! Do you save seeds from flowers in your garden to grow the following year? Yesterday was hot outside- a hot day in September! Inside the A/C was keeping our home so comfy. This heat did bring a change in dinner plans. My plan was to use my oven & the Eggplant that were just waiting in my fridge. Feeling the high humidity whenever I stepped outside did I ever change my plans. While my hubby & I were volunteering delivering Meals on Wheels to senior citizens in town I kept thinking about those Eggplants in our fridge. No heating the oven yesterday! Grilling was my second choice. The quick trip to our grocery store ended that thought with the display of the fillets of fish. But, the large fresh Sea Scallops looked so good. That was the answer to dinner. Pan Seared Scallops with a microwaved "Baked" Potato & a fresh veggie salad. Oh yum! It was so good! It also was quick to prepare! Pan Seared Scallops always taste so good! They are ready very quickly, too. So quick that the veggies need to be in works before starting the pan searing. 3/4 lb. Sea Scallops (can be about 10- 12 large ones) I request the larger Scallops. Combine Flour & Paprika in a Gallon sized Ziploc Bag or small bowl. 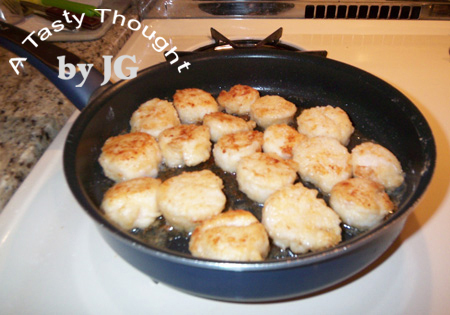 Rinse Scallops in cold water by using another bowl & then drain. Place Scallops on plate lined with a paper towel. Then place Scallops in Flour mixture & coat. Add Olive Oil to a skillet or a saute pan. Turn heat to medium/high heat. (I use a non-stick pan.) Heat until hot but not quite smoking. Take pan off heat and add the Scallops to the pan. Place back on heat and cook Scallops for 3 minutes on the first side. Turn the Scallops over and continue to cook for 3 minutes on the second side, or until golden brown and just cooked through. Remove one Scallop from pan, cut with a knife and see if done. If not, then saute all for another 30 seconds. The short road trip to Old Sturbridge Village in Sturbridge, MA on Friday was great! It was such a comfortable day to step back in time! The sun was shining brightly & we walked around with our water bottles & sunglasses. After leaving the crowded parking lot, we were welcomed in the Visitor Center. This was a no admission charge visit- sponsored by the Highland Street Foundation. This also was the last Friday of FREE FUN FRIDAYS before so many school aged children began the new school year. 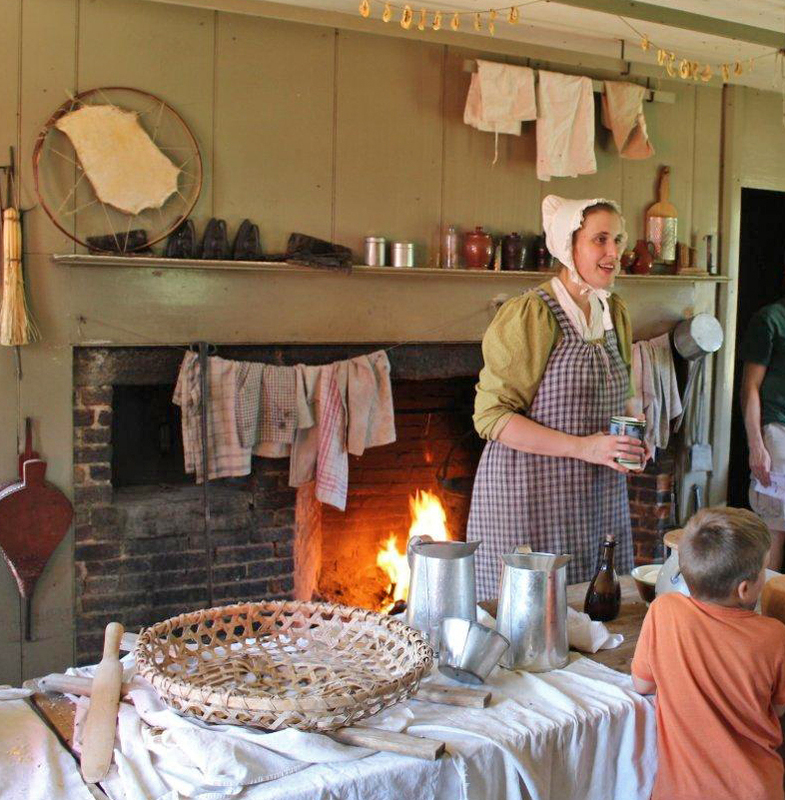 So many families learned about New England village life long ago! We all left the 21st century Visitor Center and found ourselves in the village where every day life used different methods to get every day tasks done. It was set in about the 1830's time period. What a treat to learn American History by having FuN! Our first stop was to watch & to listen to a lady explain how yarn was dyed. Her yarn had already gone through the process of the sheep shearing & spinning. She was dyeing it her color of choice- Yellow. First, the yarn was "prepared". There were many colors available to use during this time period & the colors came from objects in nature. The objects were added to a "bath" of heated water. The "prepared" yarn was then soaked for a certain period of time. Goldenrod flowers were used to dye yarn the color Yellow. A Lady dyeing yarn the color Yellow using Goldenrod flowers! In the Bank a portrait of George Washington hung proudly on the wall. Then, from the Tin Shop we walked up the road to the Grist Mill where Rye & Corn were ground. 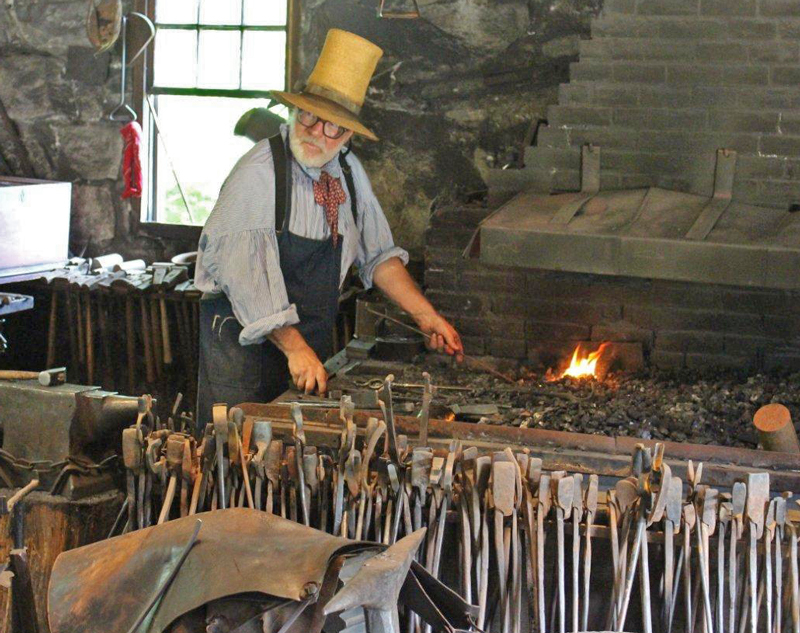 From there to the Blacksmith Shop. After watching, listening & asking questions we visited the Cooper who was making a round container from wood. Then onto the Freeman Farmhouse to learn about making Cheeses. In the summer the extra milk on the farm was used to make Cheeses. Any Cheeses that the family does not use can be sold to the Knight Store. At the store a store ledger is kept to record this sale as a Credit. The family could purchase needed items at the store that they did not make themselves using this Credit. They could also make a purchase by having a Debit on the family's account. The Cheese (& Butter in cooler weather) could be sold by the store's owner in Boston. Families living in the city would not be making Cheese. The store owner would be purchasing items in Boston that were imported- like Tea & Spices to sell back to families in the village. 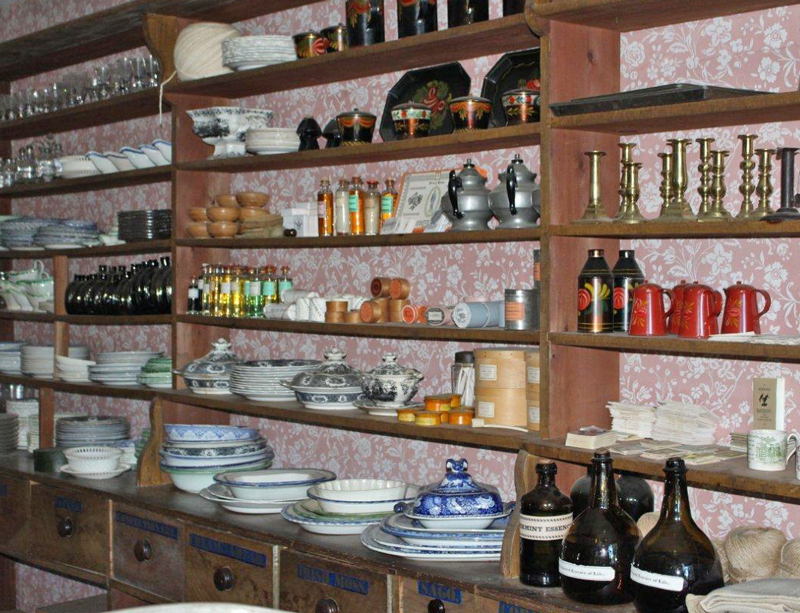 This lady's kitchen & tools in the Freeman Farmhouse were fascinating. Notice the slices of Apples drying on a string below the ceiling. Cloths drying above the fireplace. Then onto visit the Shoemaker who was busily working on a shoe while sitting on his Cobbler's Bench. 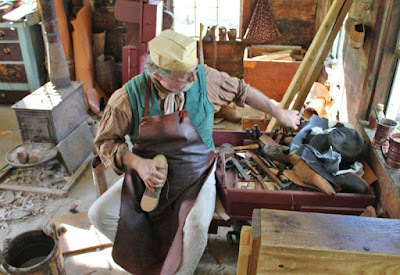 Shoemaker working on his "Cobbler's Bench"! A Potter and a School Teacher then captured our attention. Walking down the road we stopped at the Knight Store. Inside a lady was inquiring about the price of a knitting needles container. She wanted to store her knitting needles & knitting work safely. The shopkeeper also told her that there was a need for knitted mittens, so if she was interested, a pair or two could be sold to the Knight Store. In the store on the opposite wall there were many choices of objects to purchase on the shelves for the residents of Sturbridge Village. So many objects to purchase! A toothbrush with an ivory handle was in the locked case on a counter. The lady shared with me that everyone in the family would use the same toothbrush. 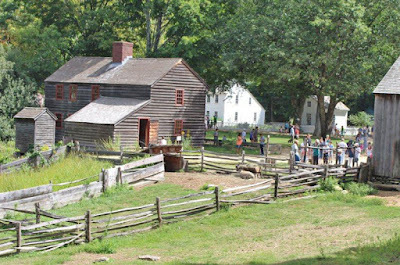 There are so many fascinating areas to visit in Old Sturbridge Village. We made our way to a few of them. The Bake Shop makes yummy Oatmeal Cookies! Many people were smiling while eating Chocolate Chip Cookies, too! 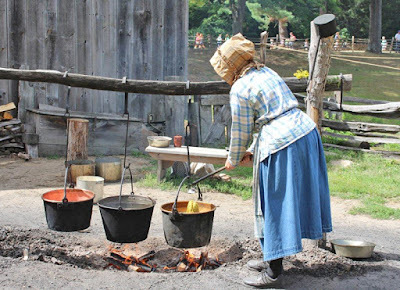 If you ever have the opportunity to go back in time to the 19th century, stop in to Old Sturbridge Village in Central MA. I've given you only "a snapshot" here of rural American life in the Northeast around the 1830's. This is a great place to visit! In the Fall the Cider Mill will be working!